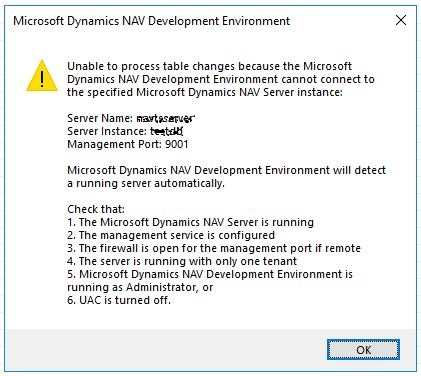 We're not able to compile any object in NAV 2016 Database while working remotely. Suppose NAV SERVER & SQL SERVER are installed in a Machine Called 'PC1' & we are trying to modify & compile its object from a Client Computer. The following error is popped up from the machine. The Firewall/Anti Virus application are temporally off though it's not working. What could be the actual reason ? Kindly reply. Check Tools-Options-Management Port in development environment. Did you run the development client as an administrator? Right click on the Dev. client shortcut and run as administrator. Sometimes, depending on environment, it needs elevated rights to make changes to tables. I've run the development client on administrator privilege & found the same outcome. Try to access the database with the machine IP instead of the machine name. Plus you have 9001 for the Management Port, is that the correct value for your service?